This little pocket rocket will knock your socks off. This 2-passenger, 13-foot inflatable raft can hit speeds of up to 50 miles per hour, and make 180 degree turns at virtually full speed! What a rush! Designed to jump over waves and race between their troughs, the ZapCat can take up to 4 passengers, but runs best with two. You'll take an exhilarating, adrenaline-pumping 45-minute high-speed guided tour into the Sea of Cortez, off the shores of Cabo San Lucas, where you'll have the thrill ride that will leave you talking about it for weeks. 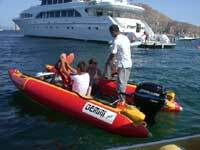 A support boat will be with you at all times for safety, and a safety briefing will be given before the tour. YOU DRIVE THE BOAT! AWESOME! Daily at 11:00 AM and 2:00 PM. Plaza Bonita Mall (next to the Nowhere Bar on the Cabo San Lucas Marina Boardwalk) or on Medano Beach next to the Mango Deck Restaurant. All ages welcome. Kids under 17 years old must be accompanied by a parent. Kids are the same price as adults. VERY IMPORTANT - Make sure to put on sunblock - SPF 30 or higher! The sun in Cabo is very strong - you don't want to be a lobster!